SANTA CRUZ, California – Students at UC Santa Cruz held a rally today for public education during the national day of protest. Around 250 gathered in the Quarry Plaza, where speeches were made and the issue of access to higher education for students of color was communicated. As the rally came to a close, the last speakers took the stage and chanted that we should retreat to where we feel safe, the Ethnic Resource Center (ERC), to discuss the budget cuts and how the crisis has affected students of color. As UC Santa Cruz has recently cut several of the few programs that existed where these kinds of discussions could possibly take place, and as students at the university have unsuccessfully petitioned the administration for an Ethnic Studies program for decades now, the ERC seemed an appropriately symbolic space. Students are criticizing the administration for the lack of support for communities of color, and that the ERC itself is insufficient. 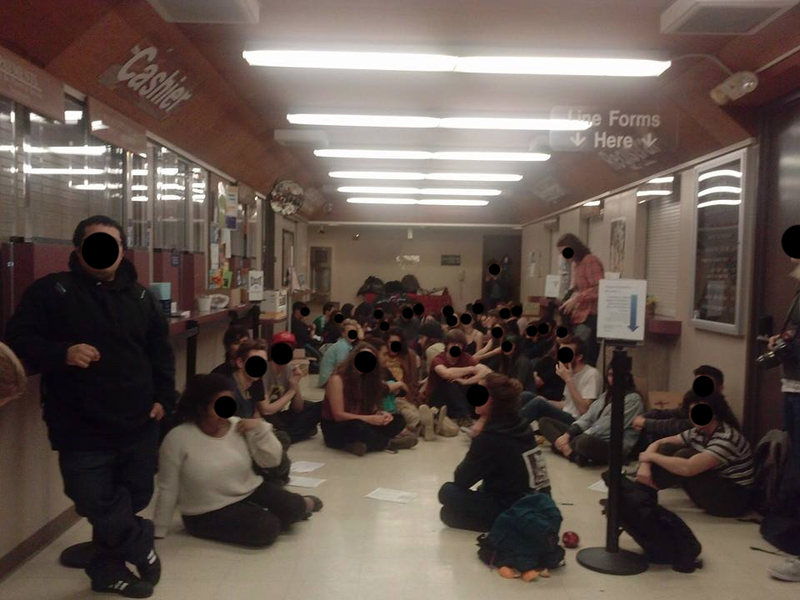 7:00pm: After lengthy discussions, the sit-in at UCSC continues. 8:35pm: Sit-in continues after all. Administrator Alma Sifuentes went back on her word. Details unclear still. 8:40pm: Alma Sifuentes, Dean of Students promised students a meeting with the Executive Vice Chancellor (EVC), however she returned to inform them they would not be meeting with the EVC. Now the students are refusing to leave and have decided to stay over night. Sifuentes has promised that no judicial repercussions will come out of the sit-in [corrected]. The sit-in has moved to the Cervantes-Velasquez Conference room down the hall from the ERC. 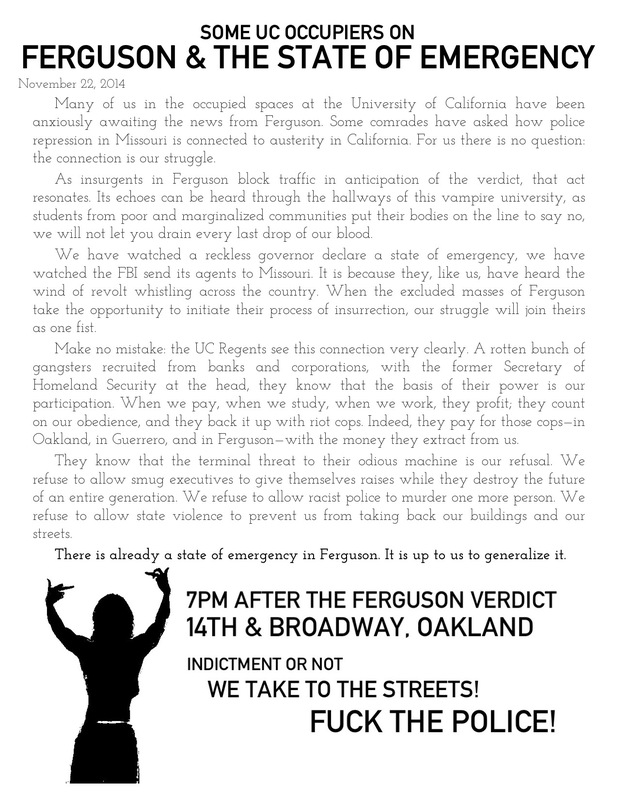 9:30pm: See Principles and Demands. See their blog. -The next morning the folks sitting in went to Kerr Hall to speak with administrators and ended the sit-in. 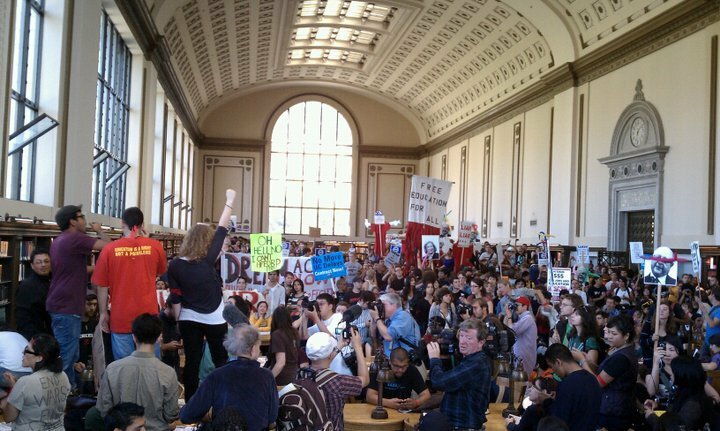 BERKELEY, California – Between 100 and 200 students are currently holding a sit-in in the foyer of the infamous Wheeler Hall. In fall of 2009, Wheeler Hall was the site of two occupations, both ending in the arrest of dozens of students. Occupiers have announced to stay past the 10pm closing time of the building. 9:50pm: Reports coming in that riot police are in front of Wheeler. 10:14pm: Reports of Alameda Police Vans outside. Arrests imminent. 10:21pm: First arrest appears to have been made. 10:30pm: Around 15 arrested so far. A crowd of around 50 stand outside chanting, moving trash cans around to obstruct the police, and banging on windows. -17 in total arrested and taken to Berkeley jail. Over 50 occupy the UWM Theater on campus. The University of California Administration and the UC Regents in particular have continued to demonstrate their callous disregard for the lives and futures of the Students and Workers who make up the University. The malicious assault which they are now leading against the pensions of employees, the conditions and wages of academic workers, and the future of students with a new proposed fee hike of as much as 20%, demonstrates not only the depth of their commitment to privatization but also their amnesiac forgetfulness regarding the events of last year. In the relative calm of the last few months they have forgotten the magnitude of the discontent which exploded in the form of mass occupations and strikes last November and on March 4th. As the regents meet to consider further austerity measures, we must act to demonstrate that if they fail to repeal the fee hikes implemented so far, if they continue to impose intolerable conditions on the Students and Workers of the University of California, we will render the University ungovernable. The UCSC Strike Committee calls upon Students and Workers across the UC system to take action on their campuses November 16th, both to demonstrate the continuing strength of our resistance and build the social power which can make the threat of an ungovernable university a reality. Photos of banner drops from Louisiana. 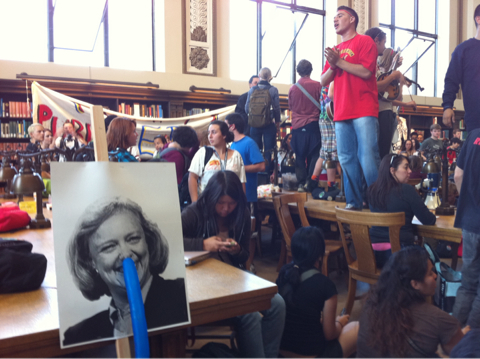 The sit-in at Doe Library at Cal is over now. 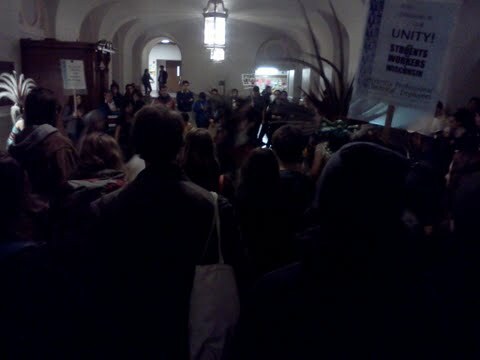 Sit-in at Mrak Hall, UC Davis over. 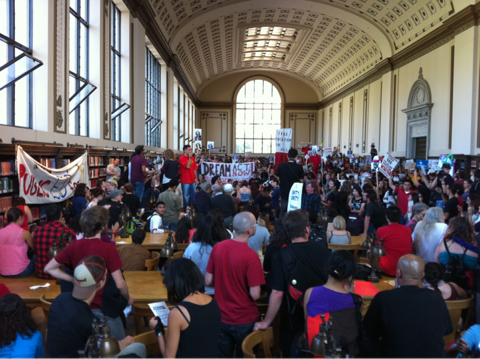 Doe Library sit-in with 600-800 people at UC Berkeley. Video Stream here. Fire alarms are being pulled at Cal, more below. Demonstrators throughout the UC system are attempting to hold a virtual sit-in, akin to a DDOS attack on the UCOP website. Updates here. UCOP apparently is countering the DDOS attack. According to the blog StudentActivism, around 72 actions are being held throughout the US. 12:02pm: ~500 people at sproul plaza. 12:06pm: Rally has grown close to 1000. 12:15pm: Fifth building with fire alarms going off, Wheeler. 1:00pm: March has started, sit-in to ensue. 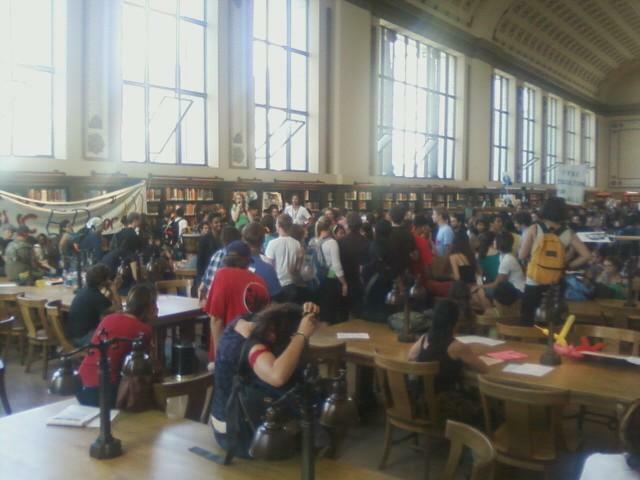 1:25pm: Around 200-300 in sit-in at Doe Library, in the north reading room. Police being sent in. 1:38pm: Staying until a General Assembly at 5pm. 1:40pm: Police closing doors, allegedly for fire hazard reasons. 1:53pm: UCPD not allowing any more to go into the library (Confirmed). 2:08pm: Demonstrators pleading with police to be allowed water and use of restrooms. They’re asking for people to come support! 2:43pm: Fire alarm pulled at Dwinelle. 5 UCPD (more?) entering Doe. 2:46pm: Another fire alarm may have been pulled at Life Sciences Bldg. 3:00pm: Fire alarms pulled at Wheeler. 5:39pm: Police using Graduate Student Center as a meeting space. Rumors of imminent dispersal order. 6:05pm: Word is that the north door of the Doe Library is open. Some participants on the ground asking asking all those who can to come down and come inside. Cops are walking around the space but are not being belligerent at this point. 6:50pm: It appears that the participants have left Doe Library with intentions to join the AFSCME protest tomorrow and organize further actions later. Faded: Not a moment too late. The dance party begins because we’ve come together to enjoy each others company and to do so collectively—to do so as a mass of people. Without an unwavering unified disobedience, no party would be possible. Let’s make this clear: this is a party, not a protest. We aren’t here to make a point to the administration, the police, or other managers of society with any message other than, “this night is ours!” We see the need to fight back against an attack on our lives, upon the unfolding crisis. Capitalism is the economic behemoth fueling the exploitation, but society as a whole reinforces it. We want to shift our focus from exclusively economic issues, or a perspective of activism, onto re-imagining society to fit our needs as a community. Within our current social framework, we are allotted specific times and designated specific places in which to have fun (for instance, during the weekends and after work; in the bars and the park). Even our free time is managed. To this point, we want a real ability to participate in society, to organize our work and our communities, but also to take control over our leisure. If we want to make our lives better, we must challenge the social norms that structure them. So join us, take over and play in the streets, and not in their playgrounds! IT’S WAY TOO LONG, SO READ IT SOBER. Here we are at a university. This may or may not be your first year; regardless, right now you’re seeking an education (or, perhaps to put it a little more cynically, a degree). It’s an opportunity to gain some independence, and some help on figuring out what you want to do with your life. Yet, as students we face the greatest amount of debt in the US: a painful reality that often leaves us worse off after graduation than before. In fact, student debt surpasses every other form of debt—even credit card debt! Rising tuition and fees at the university, coupled with unemployment pushes us further down the hole. From any angle, it paints a difficult future for much of us. Workers on this campus also face hard times, as the same conditions that created a dramatic tuition rise over the past several years have also produced severe pay cuts, greater workloads, less hours, and cuts to pension among a slew of other issues. It’s important to acknowledge that many of these workers are students at the university as well. These students are putting themselves through the hardships of a minimum wage and poor working (and living) conditions, just in order to receive an education steeply declining in quality while ascending in costs. We work and we borrow in order to work and to borrow. In fact, the very same conditions have produced hardship for people off campus as well. Using the poor economy as an excuse, the city has slashed its budget for community programs, many of which are tailored for children in poorer neighborhoods. Homelessness has surfaced as “an issue” for the wealthy business owners downtown—not out of empathy for difficult living conditions, but because presence of the homeless trims their profits down. The police budget is disproportionately reduced at a slower rate to social programs during the budget crisis, or can often be actually increased in fear of unruly poor people. The state would rather deal with angry unruly people by suppressing or locking them up, rather than finding solutions to the issues that are making them angry and unruly. It’s noticeably becoming a burden to live in this city if you’re someone who’s trying to get an education; someone who’s trying to rent an affordable, decent room; or someone who needs a job, let alone one that doesn’t leave you feeling raw after work. The term “crisis” is thrown around regularly on and off campus, in city halls and through out the state. But what we see clearly isn’t the multinational corporations, the $100k-a-year crowd, or the ‘privileged’ in any real sense of a crisis. Rather, we see ourselves in crisis and we see the management of us as the crisis. Those that slash the budget, those that get paid the big bucks, those that feel the need and have the authority to control us aren’t really concerned with the economic crisis like we are. Many of us struggle to feed ourselves, while the managers of society struggle to buy a porsche. So when they tell us about the crisis, they aren’t speaking about the stress and anxiety it causes them to cut pensions or raise tuition, they’re speaking about the stress of managing us. So really, we find that we are the crisis. With suffering, social unrest is bound to follow. With social unrest, the need to manage us, as the crisis, predictably becomes the next logical step. The university administration speaks the language of managing the crisis quite effectively; they use terms such as “the budget” and “reasonable” to direct our concerns away from themselves and to enact what they see as solutions that allegedly help prevent future problems. They re-introduce rotten policies they’ve failed to pass before, but now with the popular support produced by this language of crisis, they can get away with it (most probably due to the feeling of inevitability and passivity endorsed in their rhetoric). Finally, the managers of the crisis will further manipulate us, use coercion and use force to enact their vision into reality. The administration deflects problems by blaming the budget or the state, but they also mask their responsibility by deflecting public aggression towards protesting students and workers. They do so by criticizing our “mistakes” or controversial political actions to the point of oblivion. They reduce us to mere caricatures of adolescence, while they demand sympathy for their “tough decisions”. 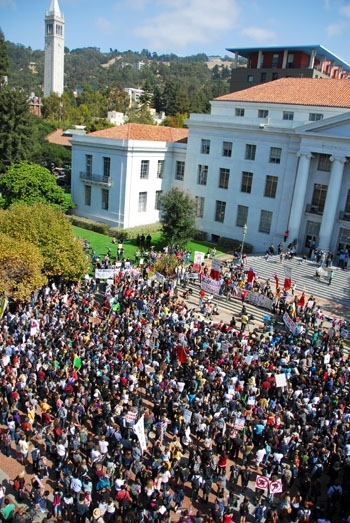 When a campus building was occupied by demonstrators and some property was damaged while being used as a barricade (or at least as some sort of buffer) against police brutality, the administration deflected any concerns of actual police violence by repetitively attacking the decision of students to protect themselves. Furthermore, the administration coerces protesters—regardless of their level of involvement in these demonstrations—through the use of trumped up student judicial charges or veiled threats to the job security of dissenting campus workers. Finally, they use force to ensure our obedience; specifically they utilize police to beat and bludgeon demonstrators getting in the way of the management of the crisis. Whether its a militant political action or even a subdued protest we often meet the blunt edge of a baton. Anyone or any people that fight effectively for themselves are a threat on the administration’s management and their status quo. This model of management isn’t unique to the university either. This model of management can be seen everywhere. Chances are that after you graduate, you’ll either join the management or continue to be subjugated by it. It’s not really that any individual person is at fault, rather an entire economic and social system that continues to burden workers, people of color, women, and all other oppressed people that must be challenged. 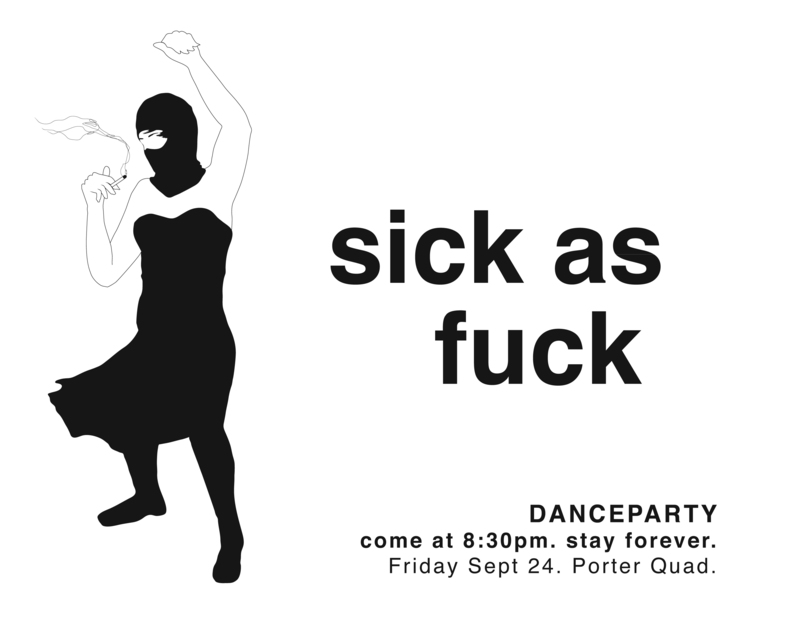 SANTA CRUZ, California – On Friday evening, a crowd of people gathered together at Porter College at UCSC for a dance party. Approximately half an hour in, dancers began moving the sound system to begin a roving dance party, with a crowd of approximately 150. As it rolled through a parking lot, a police cruiser began tightly following the dancers. Some grabbed a hold of fencing material off the side of the road, and dragged it to the center of the road, (intended to be used as some sort of barricade between the cruiser and the people). The crowd moved on and walked down an open-air corridor between two rows of dormitories. The sound system settled in the center of the corridor for several minutes as the party continued. The police cruiser following the crowd drove around the dormitories to other end of the corridor. Without any warning, the crowd began rushing away from the sound system and the scattered array of 5 or 6 police on the other end of the corridor. The police began knocking people down on the ground and grabbing any terrified person running away from them. One bystander was leaving the scene as a police officer aggressively grabbed the person. The bystander tried to escape the certain arrest, and the resulting inertia knocked the police officer on her rear-end. As of now three people have been arrested, some of their charges include: “attempted lynching,” which means someone who tries to de-arrest someone; resisting arrest, carrying a weapon, and assaulting an officer. It appears as though 2 of the 3 arrested are out on bail. SANTA CRUZ, CA – In the recently released itemized receipts (which can be found here ) from Kerr Hall there are a few interesting things that may at first go unnoticed but may provide evidence that the UCSC administration has at the very least filed a claim for damages that occurred at Kerr Hall because of the occupation and possibly even was reimbursed for the costs. This may mean that UCSC students are being charged for things that have already been paid for, which raises questions about the validly and legality of those restitution charges. On pages 1-17 there is a hand written note “Claim #2010102980” and on some pages there is also a hand written note “W000339640” accompanying the claim number. Furthermore when American Technologies Inc. (ATI) sent their invoice to UCSC for their cleaning services, found on page 18, they sent a courtesy copy of the invoice to “Sedgwick Claims Management Services” at a P.O. box in Lexington, KY. It would make sense for an institution as large as UCSC to carry property insurance especially on a property as valuable and important to the administration as Kerr Hall. Further research on the UC Office of the President (UCOP) website turned up information about “Sedgwick Insurance Claims Services”. The UCOP website describing the systemwide property insurance policy which covers all buildings and their contents owned the Regents, found here, states the third party claim manager as “Sedgwick CMS” with a listed address that is the same as the Lexington, KY address on the ATI invoice. Based on this, one can easily infer with some confidence that UCSC administration filed a claim with Sedgwick for the damages that occurred at Kerr Hall during the occupation in November. If this is true the next question would then be, is it likely that UC’s insurance accepted the claim and reimbursed the school for damages? Many commercial insurance policies do not provide coverage for damages that result from riots or other public disturbances and on further inspection of the UCOP property insurance page there is a list of what is generally covered and excluded from the property insurance plan, found here. It lists that vandalism is covered under the University’s insurance policy. While we cannot be sure as we do not have access to the actual policy terms for the University’s insurance it appears that the damage at Kerr Hall would be covered by the University’s property insurance. Furthermore, the University describes the damages that occurred at Kerr Hall as the result of “vandalism” (this can be found on the ATI invoice). If the University’s claim was approved by the insurance company and was reimbursed how much then did the University pay out of pocket? The same website which lists what is generally covered and excluded from the University’s property insurance plan also lists the deductible for the plan. The deductible is how much an entity must pay out of pocket before their insurance kicks in and pays for costs. In this case the deductible is 1,000 dollars meaning that if the total costs of the damages were reimbursed by insurance then the total cost to the University would be only 1,000 dollars. While at this point it is impossible to know for sure if the insurance company approved UC’s claim for damages at Kerr Hall it seems likely that at least some of the costs were reimbursed. Even if only some of the costs were reimbursed it does not make sense that restitution being charged to alleged participants is based upon the total $34,739.95 cost and not the actual out of pocket costs incurred by the University. On another note, if the costs were reimbursed by the insurance company the insurance company usually has the legal right to collect on those charges. This legal concept is called subrogation. According to a commercial real estate lawyer familiar with this concept, it would be unusual for the insurance company to use a proxy like the University to recuperate those costs instead that would be done through a civil proceeding. It is important to note though that many policies written recently contain a waiver of subrogation rights. The University should be clear and transparent about this matter. Students should not be charged for costs that have already been paid for by insurance and restitution should reflect the actual out of pocket expenses of the University. Saladin Sale from the UCSC Office of Risk Services, the person and department responsible for handling claims to the University’s insurance, should release information either confirming or refuting these accusations. You can contact Saladin Sale at (831) 459-3261. Repeal the 32% fee increase of 2009-10. No future fee increases. Rescind all cuts to departments, instructors, and workers. No future cuts. Restore full funding to Community Studies. Rescind layoffs to field coordinators. Rescind suspension of the major. Rescind layoffs for instructors in LALS and other departments and programs. Restore full funding to Language instruction. Rescind layoffs of language instructors. Restore funding for faculty hires in History of Consciousness and in all other departments that have had searches cancelled. Restore all TAships that have been cut in 2009-10. Repeal/rescind ALL furloughs, layoffs, START time, and/or reductions in classification for ALL workers. Expand access for all California students, with particular attention to low-income students, undocumented students, and underrepresented minorities. No tuition or fees to attend the University of California. Support the DREAM Act allowing financial aid for AB540 students. Restore affirmative action in UC admissions. Expand retention efforts on all campuses. Make quality of education the top priority at the UC. Restore full funding to campus libraries. Allocate sufficient additional funding to restore open hours to the levels of 2000-01. Reduce class and section sizes across the board. No outsourcing of grading or instruction. Wage increases for all instructors and workers above cost-of-living. Reject recommendations of the UC Commission on the Future that will limit access, harm instructional quality, or privatize the university. Fight to re-establish UC financial aid eligibility for undocumented California high school graduates. Reject recommendations to adopt a multi-year fee increase schedule, differential tuition, online instruction, three-year degrees, and to increase out-of-state enrollment. Drop all charges against student activists on all campuses. Revise student judicial procedures to allow full constitutional rights for students, including but not limited to due process rights, rights of evidence, and rights to hearings. End police/staff surveillance of students, workers, and activists. Investigate Student Judicial Affairs, the UC Santa Cruz Police Department, and Student Affairs to determine whether student and worker rights have been violated during the 2009-10 campaign of repression. Discipline any employees who have violated such rights. Institute full student, worker, and faculty control of the University of California. All administrative positions to be selected democratically by students, workers, and faculty. EVC/Campus Provost position will remain permanently vacant. Institute salary cap for all UC employees. 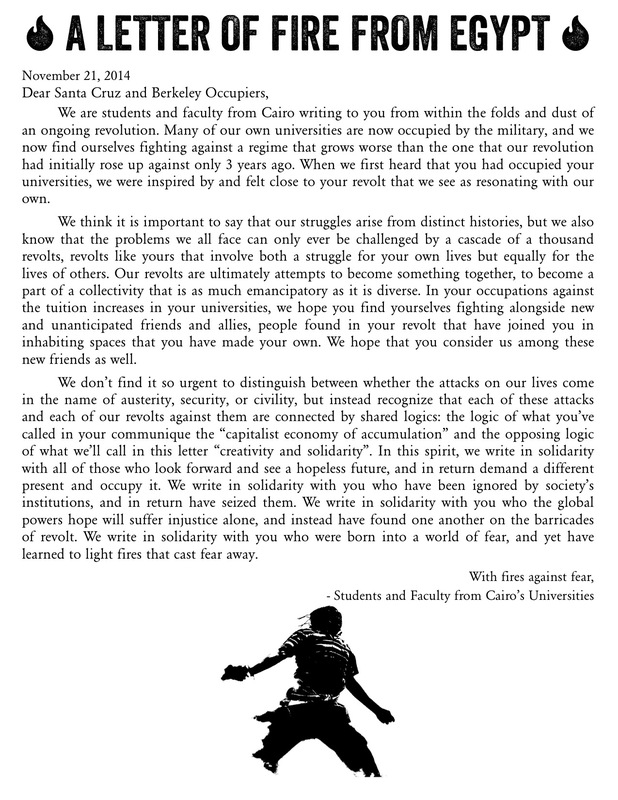 Fire Mark G. Yudof for cause: betrayal of the mission of the University of California. 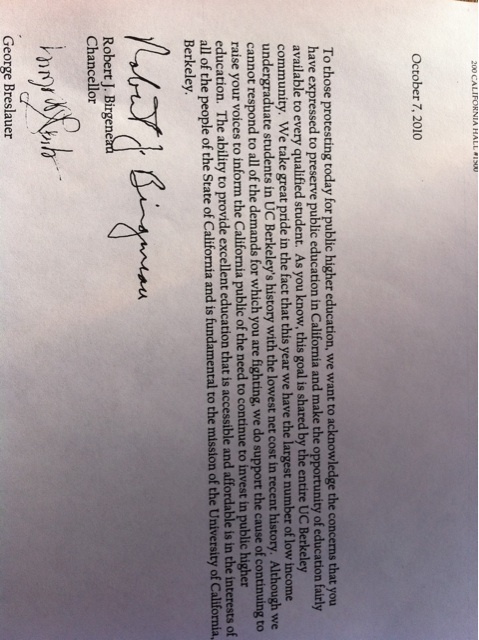 SAN FRANCISCO, CA – The American Civil Liberties Union of Northern California has sent the UCSC administration a letter this morning expressing their concerns over the “constitutional failures in the University’s disciplinary process for students who are alleged to have participated in the protest at Kerr Hall in November 2009.” The letter is highly critical of the UCSC administration pointing out significant flaws of due process that have occurred and continue to occur so far.